She’s got epic content, great images and even more importantly the passion to grow her blog. But still … her blog is hardly getting noticed. It lacks a message and fails to capture her readers’ attention. Do you also find it hard to win your readers, keep them engaged with your content and convert them into leads and sales? Like Heather, the problem with many of us is, our blog doesn’t align with our branding and this confuses our readers. Clutter, lack of white space and more importantly, choosing a design that doesn’t fit with our website’s purpose is what repels the readers away. That’s when you need nothing but the best WordPress blog theme to make your blog appealing and optimized for conversions. Having a theme that is mobile responsive (looks great irrespective of device), is clean-coded and lightweight (so that it loads fast) and distraction-free (helps converts your readers into leads and sales) is very important. In this article, I’ll list the top 51 best WordPress blog themes for bloggers like you cherry-picked (out of 1000s of them) to make your blog stand out. All of these themes will help your blog (no matter what niche you’re blogging in) with SEO, giving your readers a user experience they deserve and boost your traffic. Over To You: What’s the Best WordPress Blog Theme For Bloggers Like You? Here is a list of the best premium WordPress blog themes for serious bloggers, writers, affiliate marketers and content creators in general. Feminine WordPress themes for mom bloggers and fashion/lifestyle bloggers. 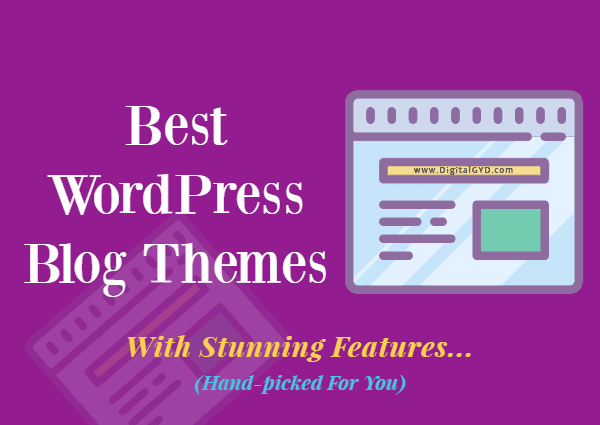 So, make sure to check out the whole list to get the cream of the crop themes out of 1000s of top WordPress themes we researched for this list. 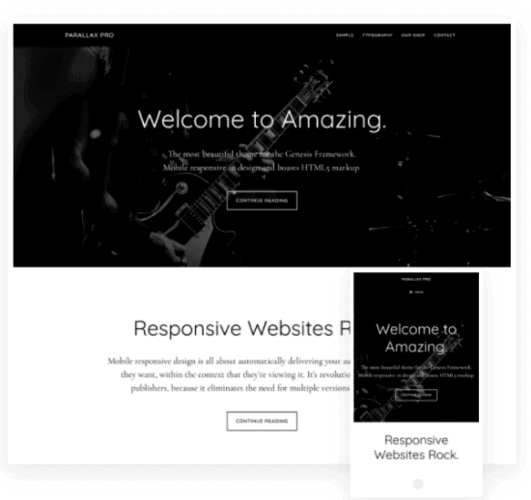 Focusblog by Thrive themes is a very powerful, minimalist yet conversion optimized WordPress theme. It has rightfully earned it’s position #1 for the best WordPress blog themes because of the plethora of features it brings with it at an affordable price. Focusblog theme, like all other Thrive products, focuses on one thing, converting visitors into sales generating leads. It has become the de facto theme for affiliate marketers (this blog is using Focusblog right now) and bloggers wo want to generate high revenue from ads. Focus blog works on the principle of simple websites scientifically perform better and has proven to convert well for its users no matter it be generating ad revenue or affiliate income. Sites like Herepup.com generate millions in ad revenue using Focusblog. If you’re doing affiliate marketing then Focusblog is the perfect theme you can choose for your blog because it is conversion optimized. Sites like Authorityhackers.com and even my own blog run Focusblog theme. Inbuilt optin box in the hero section,landing pages, optin pages and leadpages. Lightweight and comes with inbuilt image optimizer (no need of external image compressors). Extensively customizable (you can hide certain categories/tags from homepage/related posts), ability to show/hide sidebars for important posts, etc. SEO optimized, mobile responsive, inbuilt social sharing buttons and option to lazy load comments to boost loading time. One of the best AdSense optimized WordPress themes. Aspire pro is one of the best selling genesis child themes that is proven to convert well. With a stylish homepage and an email box right above the fold for lead generation, aspire pro is perfect for anyone looking to brand their blogs. Not only stylish and modern, Aspire pro is SEO optimized, mobile responsive and has a proven track record of earnings. One example of a site using Aspire pro is 10beasts.com which generated 8 figures (in USD) in less than a year. I’d like to add here that any website’s earning is not solely all due to a certain theme but it does play a important role (like conversion optimized, good CTR etc) and when a website generating such high figures uses a certain theme, there must be something good about it. 1) Over 15 homepage widgets to create a homepage of your desire. 2) Clean and modern theme with facility to boost your personal brand. 3) Apart from the goodness of Genesis framework, it comes with woocommerce setup. 4) Portfolio section, team member section and pricing tables etc make it ideal if you want to sell something or provide services on your blog. If you’re looking for a magazine style WordPress theme for your blog, Paperback theme by Array Themes is made for you. Paperback is a feature-rich magazine style blog theme that helps you create immersive content. Paperback comes with multiple homepage layouts, color schemes and fonts to choose from. Paperback theme is built to increase engagement and reduce bounce rate on your site. Featured post carousel: Greets the visitor with important posts you don’t want them to miss. Infinite scroll: To keep visitors longer on the page. Great theme to boost your site’s dwell time and decrease bounce rate. Social media icons, contact forms etc. Perfect WordPress theme for bloggers who want their content to be read and convert visitors into sales (affiliate or other). If you own a recipe blog and are looking for the best WordPress themes for food blogs, foodie pro is your thing. Built with genesis framework, Foodie pro is elegant, highly optimized to give your food blog the svelte it deserves. Foodie pro is clean, minimalist and lip-smackingly customizable so that no two sites look similar (with zero coding skills, of course). Foodie pro has strategic ad placement options, woo-commerce support (in case your brand grows and you decide to sell something) and email boxes for growing your email list. What makes Foodie pro the #1 best selling food blog theme is that it is clean coded, loads faster, HTML5 theme with responsive features. I’ve a detailed review of Foodie pro theme that you should definitely check out before buying. Visually appealing with widgetized homepage and recipe pages, flexible grid archives and featured posts widget. Unlimited color palette and typography options. Has dedicated Instagram feeds widget to showcase your food photography skills. Mobile-friendly and minimalist genesis child theme for food blogs. Schema ratings to show recipe details right on Google search results. 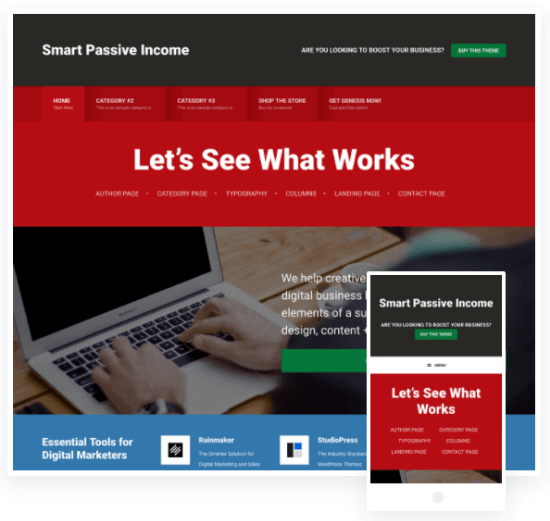 Smart Passive income theme is yet another bestseller WordPress theme for bloggers that is inspired from Pat Flynn’s blog SmartPassiveIncome.com. Pat had originally spend thousands of dollars to get this theme designed around three principles (that helped him create a 7-figure per month blog) which are design, content and strategy. And now, SPI pro comes to solve the hunger of millions of blog owners who loved his design. Smart Passive Income pro comes with a stunning design with strategic content area that creates a brand for your blog. Smart Passive Income Pro is perfect for bloggers and marketers who want to convert their visitors into leads or sales. SPI pro theme comes with prominent and attention-grabbing call-to-action buttons that can be used to redirect visitors to landing pages, show them affiliate offers (your sell your products/courses) or simply collect emails. Highly strategic theme that makes sure the attention of the readers go to the right places. HTML5 markup and clean code (because Genesis) makes it load blazing fast. 8 different widget and layouts areas to customize this as per your wish. Gives your content the priority but with a wider sidebar it makes sure to fight banner-blindness or sidebar fatigue. Divi is by far the WordPress theme of 2019 for bloggers who want to do more with their site like creating custom landing pages, formatting text and blog posts with content elements like boxes, testimonials, tables and different text styles and fonts within the same blog post. Divi by Elegant themes is a multipurpose theme that comes with visual builder or Divi builder which allows you to design your articles and landing pages right from the front-end of your blog. The drag and drop Divi builder helps in creating unlimited theme styles so you only need one theme to use it as unlimited new themes. If you don’t know coding, like me, this theme is a boon because with the drag and drop builder you can create literally any design you see on any blog. This theme is so awesome that words fall short for it, that’s why I wrote a separate review of the Divi theme to show you it’s true powers. Lots of child themes, free plugins and a huge community of Divi users to get support and inspiration from. Divi theme is perfect for bloggers who don’t want to mess with codes yet want a stellar content page. Ideal for all bloggers and content marketers. Extra is one of those revolutionary themes by Elegant themes that can stun you with the features it comes with. It is the ultimate magazine blog theme and visual page builder. I had a brief review of it when I was writing Elegant Themes review sometime ago and I was stunned to see what it offers. Create stunning post based modules with the Divi drag and drop module that comes with it. It comes with a plethora of content modules like tabbed posts, post feeds, post carousels, post slider, masonry blog, etc. With Divi builder, you can add pricing tables, accordion, blurb, contact forms, call to action, countdown times, shop, sliders maps etc in minutes. The visual builder enables you to create posts with a storytelling hierarchy that boosts engagement and time on site. Woocommerce ready, multiple header options, secondary and footer navigation. Posts and product reviews, feature to collect user reviews and everything customizable makes it a great theme for fashion and lifestyle bloggers. Studio Pro is a colorful yet professional WordPress blog themes for business bloggers with a video background in the homepage. It is the one of the best blog templates for WordPress business bloggers. It is a stylish yet minimal blog theme with schema microdata improvements and code optimization to make it SEO optimized. With Studio Pro, you can showcase your portfolio, work in gallery view which makes it perfect for creative agencies and SEO agencies. If you’re looking for a video header WordPress theme to add some personality to your website, this is what you should check out. Beautiful yet feature-rich theme for bloggers, SEOs, creative agencies or if you’re providing services on your blog. Portfolio section (masonry style with filterable items), client testimonial section, lightweight gallery section to show images in lightbox. Feminine theme by MyThemeShop is catered towards female bloggers and is the best girly or feminine theme for fashion and lifestyle blogs. This theme comes with visually appealing Instagram section, portfolio layout and signature support to add that authentic feel. If you’re looking for a feminine or girly theme, this is one of the best WordPress blog themes to have. Light-weight and minimal WordPress theme for female or mom bloggers. 3 slider options, advanced typography, 3 posts layout. Instagram section on blog page, Instagram feed widget for sidebar and stylish about me widget to boost your branding. RTL support, looks great on mobile, and ads ready to boost your ad income. Best WordPress theme for fashion blogs with lots of customization options for fonts and colors. 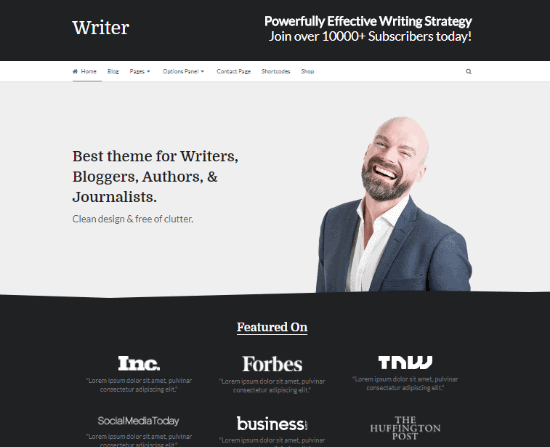 Writer theme by MyThemeShop is a great, minimalist and simple WordPress theme for writers, authors and journalists (it can be used by bloggers too). Comes with 3 homepage layouts to choose from (optimized to convert readers into subscribers and buyers). You can rearrange sections and disable any if you don’t want that. Unlimited colors and background image option to match your branding. Ads ready and SEO ready WordPress theme so that you focus on creating content alone. This theme is slightly inspired from Backlinko.com which is a hugely popular authority blog with a striking branding so you will like it a lot. The personal approach on the homepage makes it one of the best personal blog WordPress themes around. Woocommerce support and you can use one single license on 5 different websites. 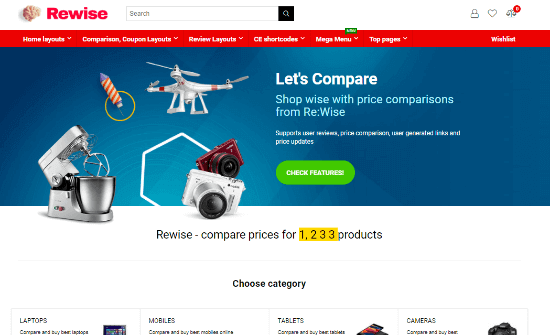 Rehub from Themeforest is an absolute feature-rich theme for amazon niche bloggers and tech bloggers who write a lot of reviews. Rehub has a plethora of features which makes it a multipurpose theme for affiliate marketers and bloggers. Membership functions, comparisons, filter, coupons, social business directory, multi vendor and extended woocommerce make it a perfect business theme. Reviews with customer review sections, table constructors and beautiful review construction templates to get more conversions. Special conversions pages like comparing two products (versus page), specific comparison pages to make more money from those Bluehost vs Siteground type of keywords. Advanced ad settings like sticky sidebar ads, branded pages, adblock notification etc. While Digital Pro by StudioPress is a WordPress theme aimed at bloggers who sell digital products, it can be used as a WordPress blog theme without any hesitation. In fact, it is so good that it’s used by top bloggers like BloggingWizard.com (recently changed it in favor of a new theme). Digital pro comes with a good homepage design aimed to convert homepage visitors into subscribers. Digital Pro is perfect WordPress theme for bloggers and writers who want to create content that is easy-to-read, builds trust and converts like charm (with beautiful CTAs). After entry widget areas to show CTA after the post. Unlimited website skins or color palettes and very stylish and innovative footer section. Woocommerce support to setup your own shop for digital products in minutes. Live customizer allows you to change the color scheme of the entire theme in one go. Magazine pro is one of the best magazine and news blog theme for bloggers looking to get more eyes on their content. It is also one of the all time best selling magazine themes that has woocommerce support, huge header ad space and 2 menu options. It comes with 3 homepage widget areas (to create a content layout you wish), ad space to the right of header and strategic ad placement options throughout the whole blog. Sticky navigation menu so that your visitors always see the options you want them to browse. Fast, lightweight and comes with the goodness of Genesis which makes it one of the best SEO optimized WordPress theme. Cook’d pro is another stylish yet minimal food blog WordPress theme by StudioPress that helps you add pizzazz to your food blog with an amazing layout and customization flexibility. Cook’d pro is designed by the same people (Feast Design co.) who designed the much acclaimed Foodie pro theme. With the minimalist yet ad-optimized blog layout, recipe filter index, heart this integration it makes a complete community driven food blog theme to boost your engagement. Check out my detailed Cook’d pro theme review to know more about it. Gives prominence to images with tall images on the homepage. Widgetized homepage, ad optimized blog page with huge leaderboard ad on the header. Email optin box ready, heart this compatible, and woocommerce integrated. Beautiful social share buttons, inbuilt contact form and the support of Genesis. Authority pro is one of the newest themes by Genesis that will make you fall in love with it. Authority pro is perfect WordPress theme for bloggers looking to demonstrate trust, expertise and personal branding through their blog. The hero image of “you” right on the homepage builds a strong brand of you (just like all the pros including Michael Hyatt, Amy Porterfield, Neil Patel, Mellisa Griffin or Marie Forleo have it on their homepage). The next section is a “as seen on” section where you display logos of popular blogs that you’re featured on. Following which comes a section where you can display your product, course or simply a lead magnet to capture leads. Despite being a WordPress business theme, all above features jam-packed in a homepage makes it one of the most ideal personal brand WordPress theme. A sticky call-to-action bar that sits on the top of every page for notifications. 2 free PSD files or templates to create eBook covers that match the feel of the theme. Very much conversion optimized WordPress theme with a highlighted email optin sidebar widget too. Fresh look and feel with plenty of whitespace, lightweight and optimized to boost your SEO rankings. Unlimited color options, schema ready, 3 layouts and much more. 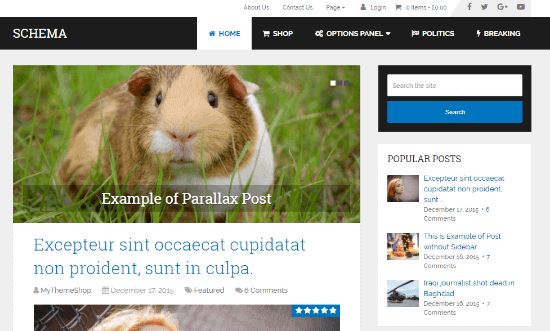 Parallax pro is one of the best theme for bloggers, writers and authors that helps them in effortless storytelling. It gives an easy vertical flow to your writing (for ease on your ease) ultimately leading the reader to the call to action. It comes with 5 different homepage widget areas with pricing tables, large social profile buttons and a call to action at the end. Not only for writers and authors, parallax pro can help you build a branded blog for you that helps with a large CTA at the end for converting your readers into leads, sales and subscribers. One site that has used Parallax pro effectively is Dustn.tv. Theme with parallax scrolling, clean design. Woocommerce integrated, sticky navigation, unlimited color options make it a perfect theme for bloggers. 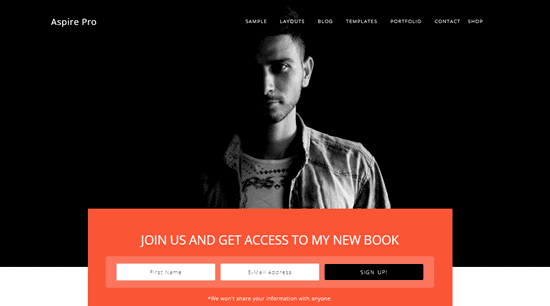 Ads ready, comes with various pages like author page, landing page, contact page etc. It has plenty of widget areas like 5 homepage widget areas, one header-right widget to place ads, sidebar widgets, one footer widget, and one after entry widget (for an optin form or ad after each blog post). Schema theme is MyThemeShop’s answer to all those who wanted a highly SEO optimized WordPress theme that is simple, bloat-free and leads faster than most themes in the market. It comes with prefetching option which automagically loads the next page (in the background) while the user is on the current page so that it loads with the blink of the eye. Schema is a simple WordPress theme with optimized code that cuts the bloat we find in normal themes to a bare zero. Yet, it is customizable to the core with multiple header designs, background options (image and colors), custom fonts, and a layout that gives your content the space and attention it needs. Perfect for bloggers and affiliate marketers, Schema is also one of the favorite themes for amazon affiliate niche sites. I honestly feel any amount of intro I write for schema here will not do justice to what the theme holds and how it can help you boost your rankings/traffic etc. So, here’s a super short video that describes how schema theme can help you. Do check it out. Quality code with clear content areas for immersive reading experience. Fast loading responsive WordPress theme, follows all schema and SEO best practices. Social sharing buttons and voting option for readers. Built-in review system for affiliate marketers who write a lot of product reviews. Shortcodes, ready-to-use icons, attention grabbing ad widget areas. Unlike the authority theme above, this one is designed by MyThemeShop and like Smart Passive Income pro above this one is designed as a replica of 6-figure earning blog by Matthew Woodward. MyThemeShop’s Authority theme is the Best WordPress theme for bloggers and affiliate marketers who want to rank high on Google and convert that traffic into affiliate commissions. Authority comes with 6 different layouts, one for affiliate marketers, one for amazon review websites, and others include tech blog layout, a squeeze page and a shop. Very fast loading WordPress theme with a proven layout to convert visitors to sales. Reduces the number of plugins with inbuilt social sharing buttons, schema star ratings integrations, related posts, author box, optimized ad placement options right in the theme. Inbuilt lightbox integrations, unlimited homesections, unlimited sidebar, sidebar author widget etc. Newspaper by MyThemeShop is a very clean-coded and SEO optimized news and magazine blog theme. Newspaper comes with professional news blog design and supports direct YouTube videos and rating system. Newspaper is the best WordPress blog theme for publishers who churn out a lot of content regularly. Being lightweight it can be the best fit for blogs in viral niche. Since, this is a premium WordPress theme, you can unparalleled support from MyThemeShop to solve your issues if any. Many cool features ideally for news websites like tabbed homepage, mega menu etc. 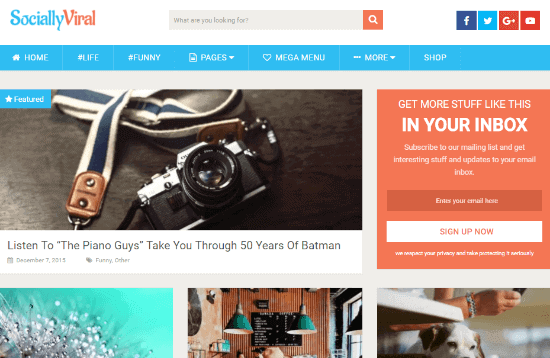 Another feature-rich WordPress theme for viral niche blogs is SociallyViral by MyThemeShop. It is the best WordPress theme for blogging content that needs social traffic. SociallyViral inspired by the popular viral blog ViralNova that generated millions through ad revenues from his blog. Designed to boost your viral traffic and make your posts go viral with scientifically designed featuresrightfully put it into the category of cool WordPress themes. 4 different loading styles to boost engagement, subscription box to boost email subscribers. Floating social icons, and lazy loading images make it perfect for slow connections. Next on the list of our best WordPress blog themes is the Rise theme by Thrive themes. 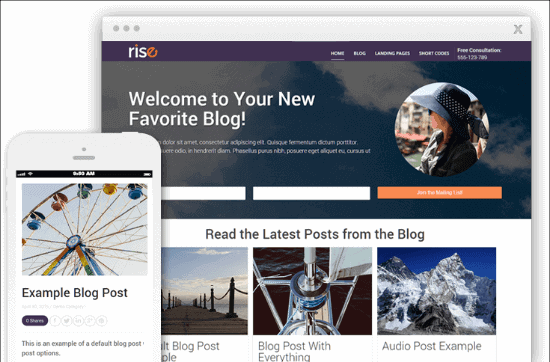 Like Focusblog above, Rise theme is also a minimalist and conversion optimized WordPress theme for internet marketers and bloggers. Rise was conceptualized and designed with veteran affiliate marketer (veteran in the sense, he’s been rocking the AM scene much before most of us knew about Internet) to create a theme that focuses on user experience and converts well. Apart from the various theme features that top themes have, Rise comes with a plethora of shortcodes to create content boxes, warning boxes, note boxes, pricing tables, video sections, testimonials and much more directly from your WordPress post editor. Automatic page generator to generate about page, homepage, landing pages with the click of a button. Large email optin box in the hero section of homepage and other pages. Inbuilt focus areas to place your custom codes, ads and banners to get high CTR. Impressive admin powers like ability to decide which categories of posts show up on your blog archives etc. Related posts, optin boxes to generate leads, multi-column extended drop down menus, phone number in the menu bar all make it one of the best WordPress themes. 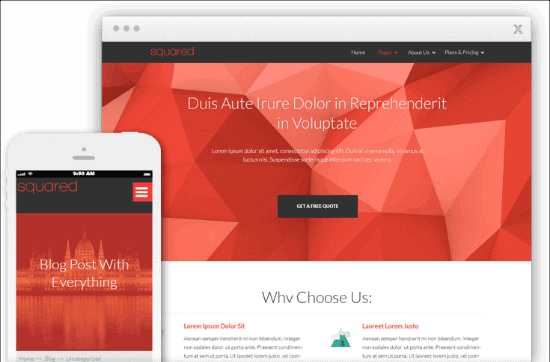 Squared theme is a mobile responsive (like every other theme in this list), flat design WordPress theme for marketing blogs that dons a bold and unique design. Like all of Thrive Themes, Squared theme is also a theme that heavily focuses on lead generation and conversion optimization with inbuilt features like sales pages, landing pages, targeted optin forms, automatic image optimization and lots more. A plethora of inbuilt shortcodes to design your posts with content boxes, tables, columns and page sections, fill counters etc without having to use any external plugin or visual page builder. Optimized and proven landing page and sales page templates that are just ready to be deployed. Large hero-section for each blog post. Ability to toggle posts that you don’t want to show on homepage, blog archives or related posts makes it the best theme to publish content secretly without letting your regular readers know. Since we are already talking about conversion optimization, MyThemeShop’s clean theme combines minimalist WordPress Theme with conversion optimized landing pages to build Clean theme. If you’re looking for simple WordPress themes that can convert your leads into sales, Clean theme is your thing. Clean theme comes with 3 different homepage layouts; a default option with sliders, a portfolio layout to showcase your skills and a regular blog layout. You might want to check out my detailed clean theme review to know more about how it can help your site. Ability to hide dates, in blog posts and even comments to make evergreen posts even more fresh. Landing page, woo commerce support, ad optimized make it a perfect theme if you’re looking to monetize your blog. Unlimited (but you should limit to 2 for maximum CTR) call to action buttons on the top menu bar. MyThemeShop is one of the best theme shops to cash in the cryptocurrency hype in the market and if you also want a piece of the crypto industries pie, there is nothing better than setting up a blog powered by Crypto theme. If you’re looking for cryptocurrency WordPress themes free of cost, check out my list of best free WordPress blog themes. 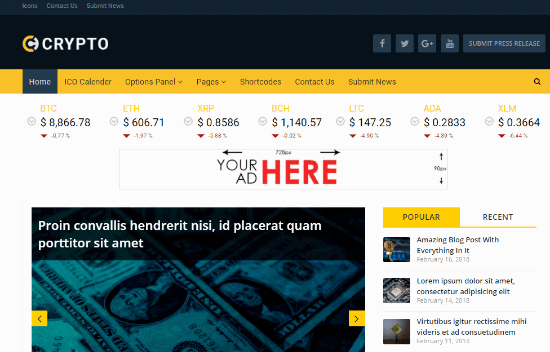 Crypto by MTS is a very well designed bitcoin and cryptocurrency WordPress blog theme for cryptocurrency bloggers. Create dedicated coin pages to create exclusive in depth guides about certain coins. Show historical coin data to educate readers and compare currencies against each other with respect to their price volatility with time. Theme designed to get a feel of the bitcoin and crypto market vibe. Steadyincome is designed for bloggers in any niche but it finds its best use with online marketers and bloggers who want a strong brand feel. You can use your own image in the hero section of the front page and display your social media following. 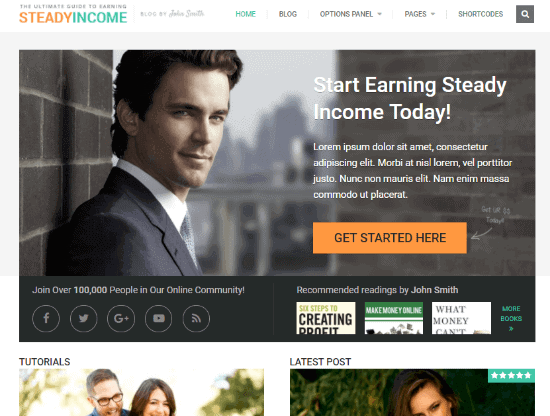 Steady Income is a great personal brand WordPress theme. Features like subscription widgets, ad optimized layout, and featured products section (to get you more sales from your blog) make it the best WordPress themes for business blogs. Prominent social media buttons on the homepage to flaunt your social media following and community. Partner logo sliders which can be also used to showcase blogs that feature you to boost authority. Ajax loading, built-in ratings, built in ratings, parallax scrolling to boost performance and engagement. JustFit is an exercise and fitness blog theme for fitness bloggers, and online website of gym owners etc. A slider section to showcase your fitness products, results and images boosts your credibility. With a drag and drop builder you can rearrange blog post’s sections without messing with the code. A video section on the homepage to feature all your workout videos directly on site’s homepage. 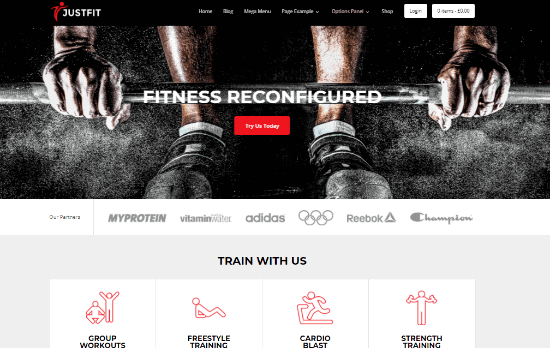 Full screen section to add impact to your workout images and products. Like all themes in this article, the theme is mobile responsive which ensures it looks good on all screens. Choose icons for training, benefits and workouts to match your style. Showcase athletes on your site with athlete progress section. Next on the list of our best WordPress blog themes is, Avada. It’s the most selling theme of Themeforest because of the robust features it offers like 38 demos and 100s of theme possibilities to give wings to your creativity. Avada comes with it’s page builder called fusion builder (which works on the backend), and shortcodes to create compelling content. Avada, if compared to Divi (listed above) has much less to offer but if you want a simpler blog theme with a page builder and tons of layout options to choose from Avada is your thing. Customizable footer widgets, sidebar widgets, show/hide page titles all prove why it is the all time bestseller of Themeforest themes. Jessica WordPress theme is a flexible WordPress eCommerce genesis child theme that lets you choose from 3 different eCommerce plugins. Jessica theme is compatible with Woocommerce, iThemes Exchange and WP eCommerce. The widgetized homepage gives you the freedom to design it the way you want. You can also choose between ads, own banners, text or ignore the sections as it is. Built with HTML5 and schema integrated theme. Product pages come with option to capture visitor email address, sizing tables, contact forms etc. Featured products, custom reviews, coupons etc make it a perfect theme for selling goods online. Easy to setup and the support of StudioPress makes it a perfect match for bloggers looking to setup an online store. 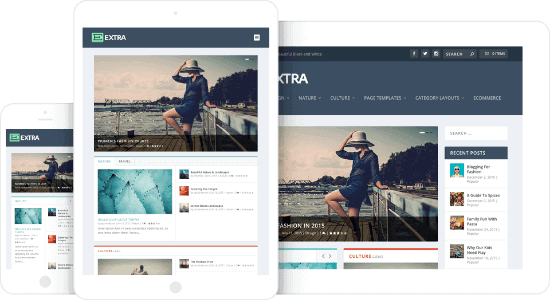 WP Astra is one of the most lightweight WordPress theme with almost no coding bloat. WP Astra is one of those unique WordPress blog themes for bloggers who use a lot of page builders to make their content more engaging and converting. With WP Astra, you can literally customize every bit and add everything to every element without touching a single line of code. Comes with prebuilt layouts to choose from. Best theme for bloggers looking for lightweight yet customizable theme. Boosts ranking because website loading speed is a ranking factor. 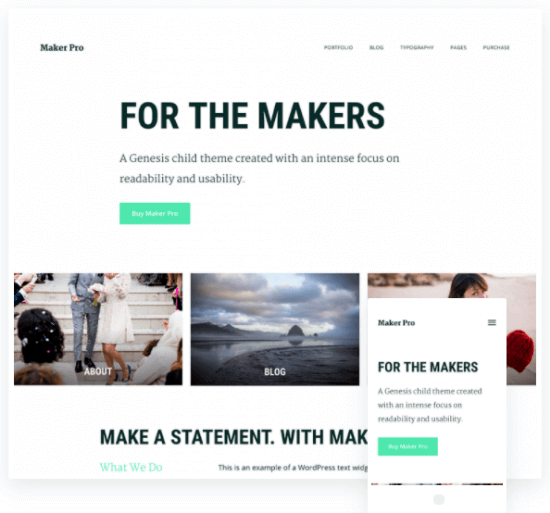 Maker Pro is another WordPress theme for bloggers that want a clean typography and lots of white space so that the call to action buttons are prominent and striking. Maker pro has an ambiance that allows users to stick around on your site. It is one of the closest medium like WordPress themes around. Coming with a portfolio section Maker Pro makes it easy to showcase your professional skills and work right on the website. Maker Pro is a fun, fresh yet minimalist theme for biz bloggers, lifestyle bloggers though you can also use it for your author website too. Custom header, HTML5 markup, 3 layouts and translation ready. Detailed tutorial to setup and use each section of theme so that you don’t have to keep wondering how to set this up. Saved the best for the last! Mai Lifestyle pro is the most powerful Genesis child theme that has a ton of features and customization option to make your blog stand out. Mai Lifestyle pro is a lifestyle blog theme but fits absolutely fine for food bloggers, business bloggers and everyone in between. The homepage has many widgetized areas starting with a huge hero section to grab the attention and convert visitors to do what you want them to do. Then you get options to display the latest blog posts, huge subscription section, a gorgeous slider to showcase your popular recipes, another section with a clear and elegant call to action asking readers to download your lead magnet. A section of recipe categories follows next (can be used to display normal blog categories if you’re not a food blogger), a product section directly on the homepage for your readers to see what you offer followed by testimonials section for credibility boost. Blog pages have multiple styles to choose from. Hero images can be kept as is, disabled, or replaced with a solid background color (to match your branding). Unlimited blog page archives layout, logo can be from left, centered or on right. Display columns, sliders anywhere with the ease of shortcodes. Best suited for those bloggers who are looking for a dashing theme and still want the ease to customize each section their way without having to mess with codes. I’ve just added 51+ stunning and beautiful WordPress themes for bloggers, writers and affiliate marketers no matter what your blog topic is. There’s no one size fits all rule so feel free to choose the one that has the best blog layout for your blog type. 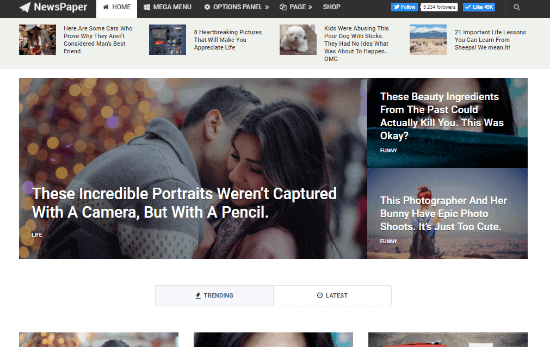 For example, if you’re looking for a simple WordPress theme that boosts your ad and affiliate revenue you should definitely check out Focusblog. Or if you’re looking to for a theme that gives you the power to build any website design and has drag and drop builder to design your content and landing pages, Divi is what you need. Remember, never compromise with your site design. This is what gives your readers “the first impression” about you and your business. So choose the best WordPress blog theme that aligns with your goals and guides the reader to where you want them to go. Still not convinced? Check out our StudioPress Sites review to find a full collection of beautiful WordPress themes for bloggers, free website hosting, email list building plugins, social sharing plugins, option to host your own podcasts and more. We have built our website from scratch and our blog is set up on WordPress. We are confused as to which theme we should use? Earlier we were thinking to go with Newspaper X theme but it has some limitation and we want to go with the minimalistic look. Which theme would you recommend, where we can edit it to our liking. 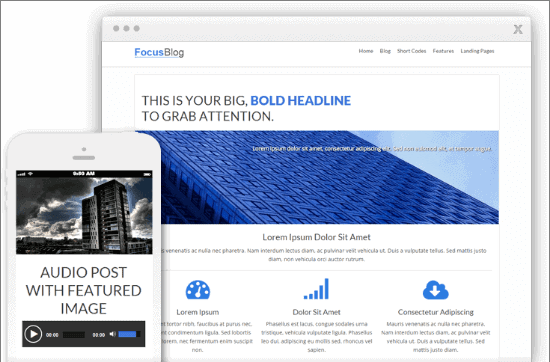 I recommend choosing Focusblog theme that’s known for being conversion optimized or you can choose Divi that has unlimited customization options. Let me know how your new site looks once you’ve chosen your perfect theme! Really nice list of some of the best blog themes for bloggers! You are completely right! The theme you select is like the body language of your blog. Mega important.